Nyingchi, or "Throne of the Sun" in Tibetan, is located in southeast Tibet, where the Himalaya and Nyainqentanglha Mountains extend parallel from west to east like huge dragons, joining the Hengduan Mountains in the east. It is adjacent to Yunan and Qamdo to the east and northeast, Naqu to the north, Lhasa to the west and Shannan to the southwest. It is a northern neighbor to India and Myanmar, with a border 1,006.5 kilometers long. Nyingchi, with a total area of 117,000 square km and a population of more than 140,000, has 7 counties under its jurisdiction: Nyingchi, Mainling, Gongbo'gyamda, Medog, Bome, Zaya and Nang. 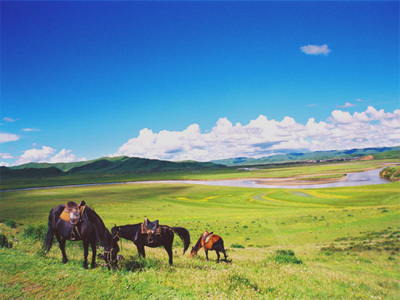 With its green mountain slopes, snow-capped peaks and crystal-clear rivers, Nyingchi has been compared to a heaven on the Qinghai-Tibetan Plateau. The climate of Nyringchi is dramatically different from the rest of Tibet. The effects of the summer monsoon in Assam bring great amounts of rain from early June to September. Snowfall generally starts in October. The best times to travel are late March, April and early May, or from September to early November. Nyingchi has snowy mountains, blue lakes, villages and ancient monasteries. The area enjoys exceptional advantages in human and natural resources. The Nyingchi residents are striving to build the area into an international forest park at the world's "third pole," where people can travel, climb mountains and cliffs, explore, drift along rivers and conduct scientific investigations. The distinctive folklore, music, songs, dances and athletic competitions of this area also add color to the beautiful scenery. 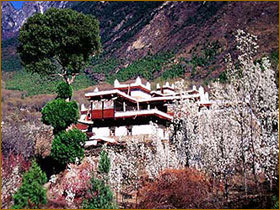 There are 8 scenic zones and 35 scenic spots in the Nyingchi area. Among them the Yarlung Zangbo Great Canyon with a spectacular U-turn might be the most famous. There is a wild peach forest about 5 kilometers southeast of the Nyingchi county. The local people call it "Peach Blossom Valley". Peach Blossom Valley is surrounded by mountains on three sides. The streams in the forest flow with water so clear one can see to the bottom. Countless ripe peaches hang on the trees and numerous species of birds sing in their branches. The Peach Blossom Valley is a wonderful natural paradise. The wild peach forest is a part of the forest zone in Nyingchi, and locals have come to cherish the peach trees not only as an evergreen ornamental plant, but as delicious fruit and even medicine. Every March and April the peach blossoms of Nyingchi bloom all over the mountains and plains, giving occasion to the annual "Peach Blossom Festival" which attracts numerous tourists from both China and abroad. The Huge Cypress Nature Reserve in Bayi Town, about 40 kilometers west of Nyingchi County, is a complete forest of huge cypress trees. Among these cypress trees, there is one which is 46 meters tall, 18 meters thick, about 2,000-2,500 years old and respected as sacred by the local people. The giant cypress, also called the Yarlung Zangbo cypress, is a species peculiar to Tibet. This giant cypress forest records a natural history of several thousand years and is highly valuable in the studies of plants, climate, geographical and geological conditions, hydrology, air pollution and human activities during the past millennia. With its upper reaches formed by Yangwogou, Jiaxingou and Bujiagou, Niangpugou lies 50 kilometers west of Gongbu Jiangda County and represents one branch of Nyang River. There is one Karst cave at the end of Bujiagou and three hot springs at 4200 meters above sea level: the upper is Nun Hot Spring, the middle is Lama Hot Spring and the lower Buru Hot Spring. Lots of old trees surround these hot springs, which together with the numerous caves and brooks compose a grand symphony. The northwest Yangwogou is well-known for its strange stones and perilous peaks. At the bottom of the mountain, Baga Temple (or Baiyanshan Temple) has existed since its construction during the period of the 5th Dalai Lama. The natural cave is decorated with numerous paintings of Buddha. There is a Karst fountain at the bottom of Baga Temple which spews consistently six times every day all round the year. Nyringchi (Nyingtri, Linzhi) is small but is actually the county capital city. Travelers should all have the necessary tourist permits, or you may be stopped here, fined and sent back to Lhasa.